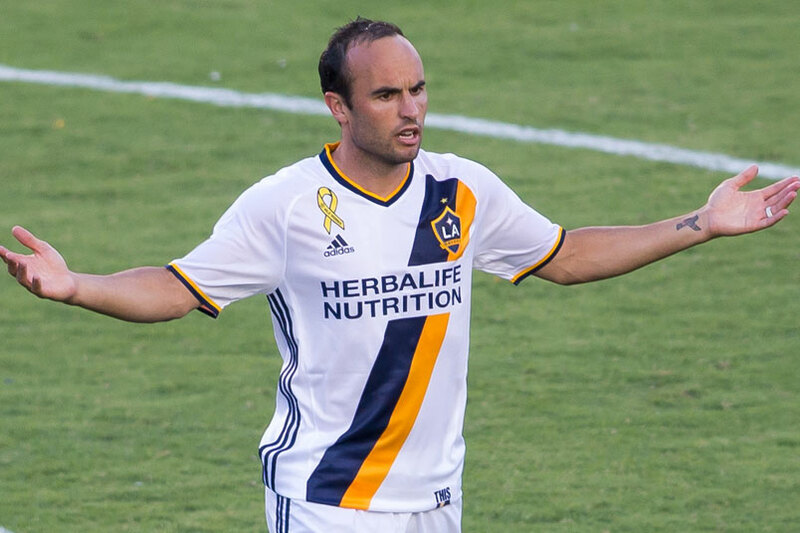 Landon Donovan can lay a claim to being the best ever soccer player from the United States due to his numerous outstanding accomplishments, both with his club and the national team. The legendary USMNT player, who starred mainly for the Los Angeles Galaxy, is the second highest capped American player of all-time and a four-time winner of the U.S. Soccer Athlete of the Year award. Donovan was born Landon Timothy Donovan, one of five children to Donna Kenney-Cash and Tim Donovan on the 4th of March, 1982 in Ontario, California. He and his siblings were raised by his mother who worked as a special education teacher. As a young child, Donovan grew interested in playing soccer after watching his older brother play. By the time he was six years of age, his mother allowed him to join a youth league where he notably scored seven goals in his first game. Donovan later spent a number of years playing in Rancho Cucamonga for a California-based club called Cal Heat. His performances there earned him a place in the U.S. Youth Soccer’s Olympic Development Program in 1997. Two years later, at the age of 17, Landon Donovan enrolled at the prestigious sporting college, IMG Academy, in Bradenton, Florida. Landon Donovan’s stay at IMG was cut short as he was able to land a six-year contract with German side Bayer Leverkusen a few months after he joined the school. The rising soccer talent quickly moved to Germany and joined Leverkusen’s reserve team where he scored 6 goals in 20 appearances in the 1999-00 season. The following year, Donovan suffered from homesickness as he struggled to adapt to life in Germany. He managed 3 goals in 9 appearances in the 2000-01 season before it was decided that he would be loaned to a Major League Soccer team, the San Jose Earthquakes. Donovan found immediate success in the United States as he managed 12 goals in 30 appearances to help his side win the MLS Cup in 2001. Donovan spent a total of four years with the Earthquakes before returning to Germany in 2005. However, after just a few games with the team, he requested to leave the club to return back to the U.S. where he joined his hometown team, the Los Angeles Galaxy. Landon Donovan, who had been named the U.S. Soccer Athlete of the Year three times in a row during his loan stint with the Earthquakes, put pen to paper on a deal that made him the highest paid American player in the MLS. He did not fail to live up to expectation as he went ahead to become the Galaxy and MLS all-time leading goal scorer. During his time with Galaxy, Donovan had two loan spells in England with Everton and one in Germany with Bayern Munich. In 2014, Donovan called time on his career but however made a comeback two years later in 2016. He joined the Galaxy for that season before again retiring at the end. In January 2018, Donovan again made a U-turn on his decision to retire as he signed a contract to play for the Mexican side, Club Leon but by June that year, the club decided to terminate his contract, sending him into retirement again. Landon Donovan is currently in his second marriage. His first marriage was to actress Bianca Kajlich who is best known for playing the role of Jennifer Morgan in the CBS comedy series, Rules of Engagement (2007 – 2013). The couple was the talk of Los Angeles when they got married on the 31st of December, 2006. Everything seemed rosy until the pair announced their separation just two and a half years later in July 2009. They were talks that Donovan and Kajlich might patch things up but by December 2010, the LA Galaxy star man filed papers for divorce from his wife. It took a couple of years but Donovan eventually found happiness again as he married his girlfriend of a few years, Hannah Bartell. Bartell is a graduate of the School of Hospitality of Boston University. After graduating, she worked at the Renaissance Hotel in Los Angeles before enrolling at the University of Southern California where she received her MBA. She has since then found work at JW Marriott Los Angeles where she holds the position of senior sales manager. Donovan and Bartell reportedly began dating in 2013 but it was until 2014 that they were spotted out and about together. Donovan took to Facebook to announce his engagement to the public before going ahead to exchange vows in May 2015. Together, the couple has two children; a son named Talon Bartell Donovan and a daughter named Slate Bartell Donovan. Landon Donovan is 5 feet 8 inches (1.73 m) tall and weighs 154 pounds (70 kg). The 1999 FIFA U-17 World Cup Golden Ball winner has a twin sister named Tristan Donovan. Donovan won a record six MLS Cups as a part of both the San Jose Earthquakes and the LA Galaxy. He is also the league’s all-time top scorer and has the most assists with 145 goals and 136 assists. For his achievements, the Major League Soccer MVP Award was renamed to the Landon Donovan MVP Award.